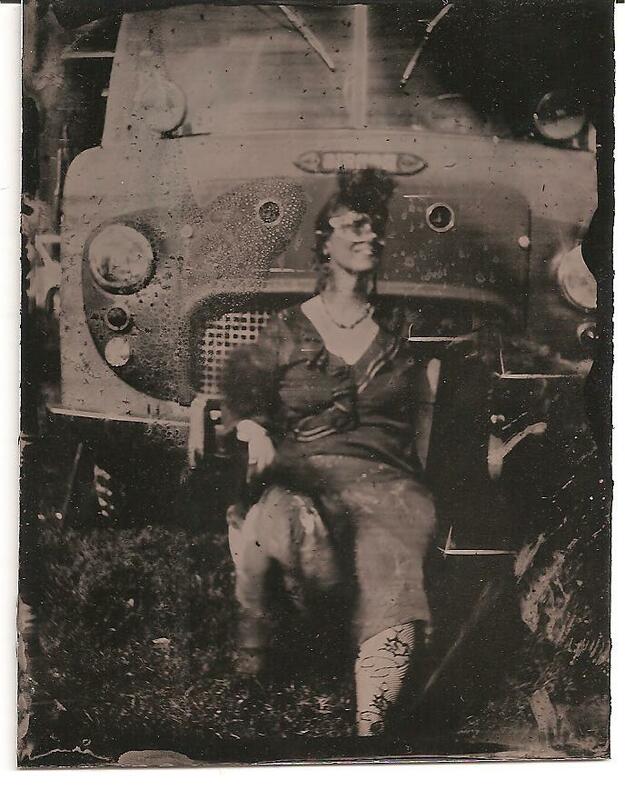 This striking tintype portrait of Rrose Sélavy was taken by Doctora Memoria da Silva circa 1922 and believed to be in New Orleans. Documentary evidence makes mention of a mysterious Mr Shifter, but his identity is not known. At the time, Rrose was known to be performing as part of a cabaret act billed as the Outhouse Movement at a vaudeville theatre called Y Foel Welsh. It is likely that this was her performance costume. If anyone has further information about the origin of this photo, please contact the writer. Having done two this month, it seems like a good time to collect a record of the large and small live performances of various sorts I’ve been part of since the re-development of myself as an artist nearly two years ago. These don’t always get noted in the blog or scrapbook. They are in reverse chronological order here. The photo to the left is by Mark Mortimer, taken at the Upright Egg Shebang. summer 2009-present – singing and playing guitar at the gwerinABERfolk Tuesday sessions at the Coops. This is something like an open mike without the mike, and is not limited to folk music by any means. People tend to quietly listen to the performances as it goes around the circle. There is any kind of acoustic music (even electric music at times) and poetry. Mostly I sing my own songs, some traditional songs, and some covers of singer-songwriter type stuff. Once I have read poems, might do that again. It is a very friendly group with a wide range of talents and I recommend anyone interested to go along and check it out. Ian Gulley organises this and creates a lovely warm and welcoming atmosphere. 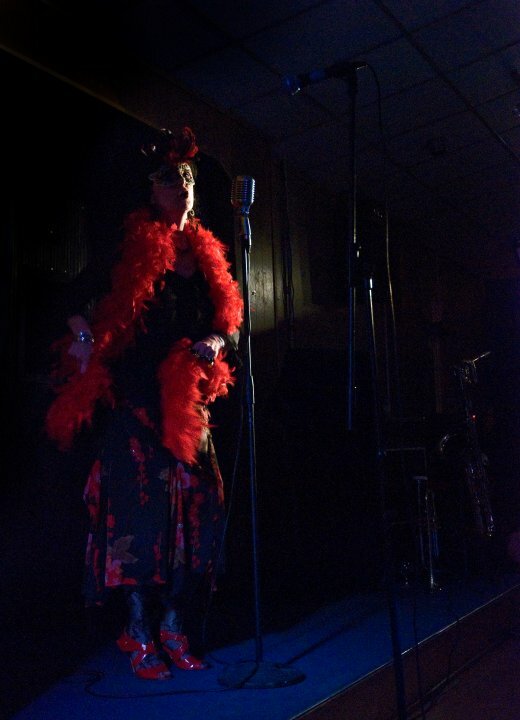 20 March 2010 – walkabout and one song at the Upright Egg Shebang (cabaret evening) at the RAFA Club. This is the second time that Tony and Cory have organised an Upright Egg Shebang on the Spring Equinox. This evening is fantastic but hard to describe, but my bit was to do Rrose Sélavy in character with full costume including six-inch red spike heels (borrowed), red feather boa and Mardi Gras mask. The rest of the outfit was a nice black top and flouncy skirt with sequins and rose print, fishnet tights with rose pattern. On the stage (with mike!) I did an a capella version of my song ‘Portrait of Rrose’ with an intro in fake Cajun. 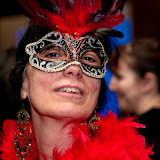 The walkabout portion of the evening involved interacting with the punters (audience members) individually in character. It is pretty much a comedy evening, so I played it for broad humour. In a way, it is similar to what I did for ‘Stuffed Bird’ (see below), except that I was in character, with accent. People seemed to like it, and I found the same thing as before…I had the opening worked out in advance but improvised as I went along, and then was able to build on the improv I’d done with one person when interacting with another. I have to say that I wore flat shoes for most of it, only in the heels for the singing. With mike. Have I told you that yet? See below….I’m getting addicted to singing with a mike. If it isn’t too unmodest, the audience response to the singing was great. I feel I’ve really developed my voice over the past year plus of focussing on music (started doing this seriously in January 2009, thank you Ted for inspiring me). 12 March 2010 – Singer-songwriter evening in Machynlleth organised by Harmony Bee. Each performer had a two-song slot. Mostly people do their own songs, but there were a few covers. I did two of mine – ‘Random Walk’ a capella and ‘Barbed Wire on the Borders’ with guitar. I don’t know how often these events are, but it was a great evening with lots of really good performers, held in an intimate space. Some people just come to listen. It is a proper performance with mike….I realise that I really really like singing into a mike. It gives you more ways, somehow, to control your voice and bring out rich tones. December 2009 and February 2010 – Borth folk session at the Friendship Inn. This is a once-a-month open session in Borth, featuring members of the Hittites and others. I’ve played twice so far. It is more of a typical ‘jam session’ where you can play anything you want, and anyone who wants to join in, just joins in. It is great for me, as I’m able to learn new songs as well as play my own stuff. It is a lively pub night where the people come to the Friendship Inn specifically for the music. We probably had about 10-12 musicians each time. The closest thing to this experience for me was back in a previous decade when I first started to play guitar in Virginia, where people would jam at someone’s house at a house party. I learned a lot from friends there. There is no culture in the US for having jam sessions in pubs. Anyway, hope to go back to the Borth sessions whenever I can get the late-night transport back to Aber worked out (I can get there by train but there is no public transport late in the evening to get home). 20 January 2010 – Axons and Dendrites at the Arts Centre. Anyone following this blog should know about this by now. Some members of the Surrealist Salon Sélavy plus a few others spent six months in total developing and practicing this performance piece. It was a cross-modal improvisation using music, sound, narrative, poetry, dance and movement to express the sense of one journal entry in the series Extracts from the Journals of Rrose Sélavy. It is well-documented in the Conceptual Art Scrapbook. It was an exhilarating night. We had suspended the regular salon evenings, and now have started to re-instate them. 20 November 2009 – 20-minute set as part of a Dark Gate nightclub night at the RAFA Club. I sang and played five songs, four of which are my own compositions plus one cover, ‘VooDoo Workin’ by Imelda May (cover of a Charles Sheffield R&B song). I’m not sure how to refer to these evenings, but people in Aber might say ‘Matt’s night at the RAFA’. These are fantastic evenings with several headlining bands and one or two supporting acts (I was a supporting act). Matt transforms the back room of the RAFA into a nightclub with professional sound and light show. You get a whole night’s entertainment for a modest door fee. This was my first proper music gig. November 2009 – singing and playing guitar for a couple of my own compositions at Scholars pub open mic nights. They have had a variable schedule, but I performed on two occasions. This was my first time singing into a mike. The first time I played, I had to borrow someone else’s classical guitar because my acoustic folk guitar couldn’t be picked up by the microphone. It was my first time trying to properly play a classical (wide-neck nylon string) guitar, being used to narrow-neck steel string guitars but it worked really well and I’m thinking I might consider getting a classical guitar in future. The second time, I used my own guitar with a borrowed pickup. 5 December 2009 – Stuffed Bird. Presented as part of Freaks and Geeks at the Ceredigion Museum, this was a live piece where I constructed a sculpture while interacting with audience members as they walked past. There was a lot of improvisation and development of the piece in the audience interaction, but I wasn’t exactly in a ‘character’. I asked the audience members questions in response to my clothing changes, in order to ‘interrogate’ preconceptions. 28 November 2008 – In/Out of the Box. Presented as part of Showroom upstairs at the Coops, this piece had a video clip I made with soundtrack by Dr. T and a live component with performance by myself and music by Christoph. It was complete prepared in advance, not improvised. We are in the booklet too, of course. If you are in Aber, come to see us!